Get ready for mayhem and the overwhelming invasion of angry pigs, as we've just received word of a new action shooter by the name of ' Bacon Rebellion ' that is aiming for your Steam Greenlight votes. 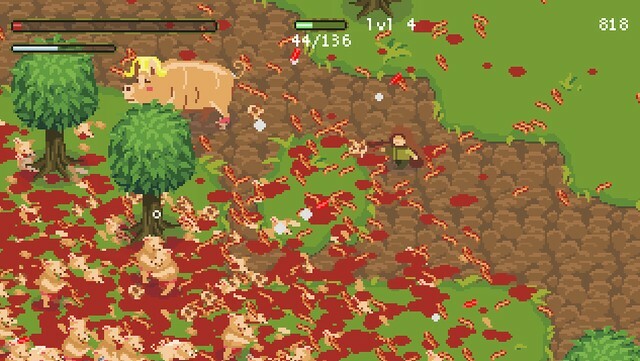 Developed for the PC, you play as a lonely shepherd with many weapons at his disposal that must defend his pasture from a mass pig invasion that will come in dangerous numbers. It's down to you to blast these waves of pork into bloody gibblets, while picking up power ups and using over 30 perks. So far the game is getting very positive replies in the comments, and it looks as if this game will be a Steam Greenlight success very soon. As such my pitch fork is ready and those piggies will suffer my wraith!